We’ve had these cute little bundles of flavor all summer long and I’m just now getting around to telling you about them. I’ve always wanted to wrap fish in banana leaves, and when the A&G had said leaves in their freezer section, I pounced. Then sadly they sat in my freezer for, well, forever. But don’t worry if you can’t find any you can use foil as well, or just poach them with a little water in a frying pan on the stove. Either way you’re a winner! One of the reasons we’ve had them so often is not only because they’re delicious, but I make up a bunch of the herb paste and freeze it in individual servings. I also served it with the wonderful Asian Slaw. from Steven Raichlen’s Planet Barbecue! Plan ahead and make this 12 hours ahead of time. 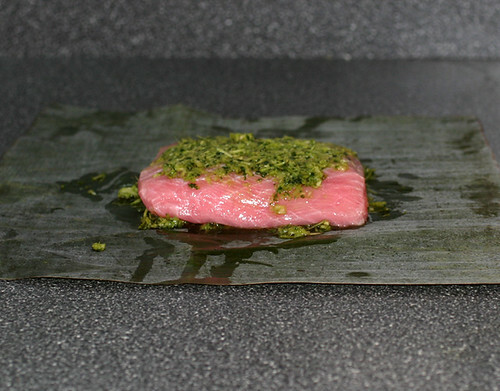 Place a square of banana leaf or foil on the counter and a spoonful of herb paste in the center. Place the fish on top and another spoonful of herb paste. 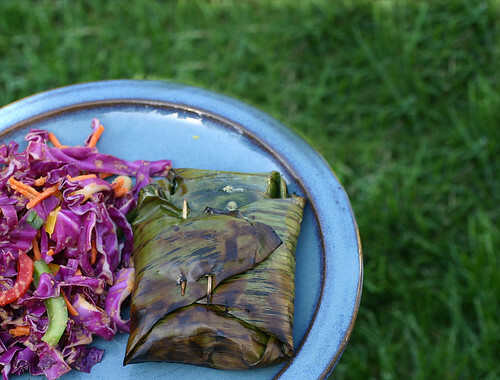 Wrap up the fish with foil or banana leaf like an envelope or a burrito. Let the fish marinate for 2 hours in the fridge. Optional to serve with this Dipping Sauce. We found it distracting. Great fish recipe. I like to do fish foil pouches with potatoes and onions. Your Herb paste sounds fab. I’m wondering if the banana leaves would work instead of foil. The herb paste would be a great flavor for the potatoes too. We do fish in foil a lot. I usually use butter-mushroom-sherry or onion-lemon-dill seasonings. The paste sounds delicious for a change of pace. Why did your fish turn pink? That’s the color of the shark when it’s raw. I am not a huge fan of fish, but my local ethnic grocery store sells fresh banana leaves – I saw them over the weekend and thought “I wonder what you do with those?” Now I know!